This year there have been a small rash of random YouTube videos and articles regarding the Harbor Freight Saw Mill with 301cc Gas Engine that they offer -sometimes at a ridiculously low price if you catch the sales and coupons. Yes there ARE bigger, better mills out there. Maybe for a lot less than the $1680 I spent on mine, if you managed to build it yourself. I didn’t have the time to do so, nor all of the parts on hand just yet to build my own with all sorts of fancy-shmancyness. That’s fine, because this lil rig is making lumber just as well as a larger “name brand” mill does. -aaaand I’m not out the 5 or 12 grand that those bigger mills are going for these days. I rotated the pull starter by about 90 degrees. It just feels easier to pull the rope form the right side of the engine, since you know -yer standing on the right side of the mill anyway. That was easy, just 3 bolts and it was back in place in a minute. The cutting guide is a joke. I don’t use it. I keep a tape measure on hand and index from a flat surface once I have the slabs pared off the cant. Each full crank of the arm to lift/lower the saw head is .25 inches. 4 cranks to an inch -it’s easy enough to keep in your head. Once I have a squared cant, I make a note of the position of the crank handle. Max cut height from the top of the deck is a flat & true 24 inches. Max cut width is 21.5 inches but I stick to an even 20 inches when I can. That’s actually a lot more room to work with than you might think. I’ve been surprised by the size of some logs I have managed to put through this thing so far. Once you pear off a limb, or trim off some bark slabs -you can get this lil saw to eat right through some decent sized bolts. The blade that the mill ships with is good for training yourself in. It dulls fast. Real fast. In my case, the 2nd bolt I set on the deck (without any bark and clean of dirt/metal/etc) showed just how fast that blade lost it’s edge. That was fine, I knew it would be sub par long before I made the purchase. After I got familiar with the mill I bought a box of 10 Cook’s Xcel Black 144” 1-1/4 x .042×7/8” Blades (CODE: XCEL1212427B). These are far stronger and slightly larger than the factory blade. As such, the saw head did slow down in speed just a fraction, but not enough to matter. 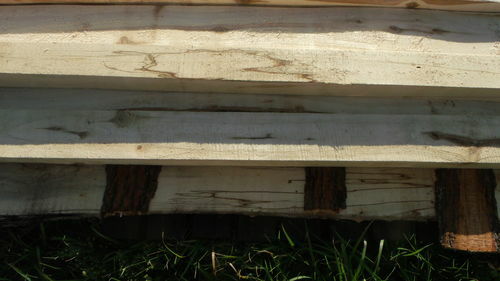 With the new blades I’ve been quite busy taking logs that nobody wants, and milling out some stunning boards. All in all, I’m happy with the rig. And so are my neighbors. And so are a few local hobbyists who stop out now and then for a special board or two. With the spare blades and a method to sharpen them, I’ve taken to cutting some things that make other mills cringe. The oak in the photos would fall into that category. Wood doesn’t bleed black -that’s old fence wire and rifle bullets. It’s more than 50 years old, so the saw has been taking it quite well. I keep a metal scanner close by though -I’m not that crazy to just cut willy nilly into anything. 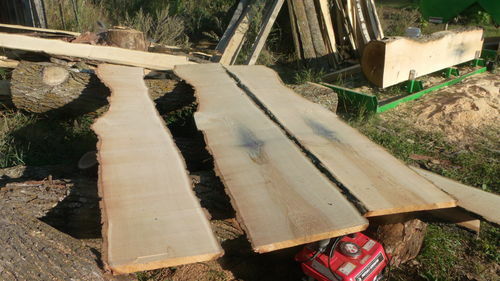 There is not too much more in that old oak that I can cut safely. I will probably manage to pear it down to an 8”x8” beam, leaving as much metal in the center as I can. 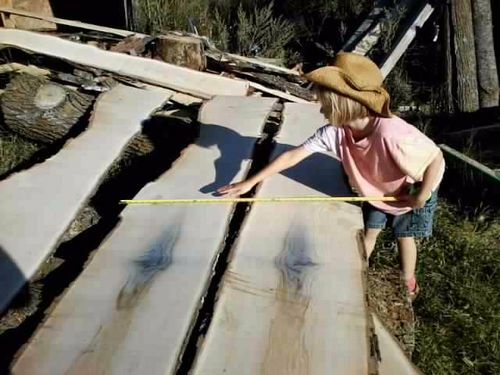 In some of the other pics are slab-veneers of Norway Pine that the neighbor asked for, some Aspen -some of it spalted, a bit of flames Aspen (orange and pinks oh my!) 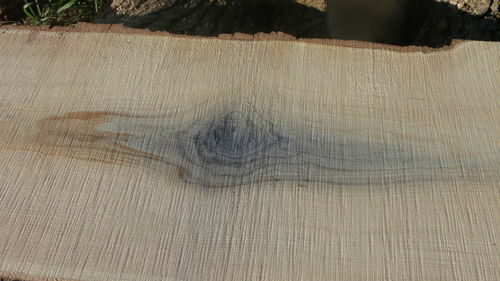 and a fair bit of American Elm. You can see some shredding on the boards, that was before I cleaned and sharpened the blade. 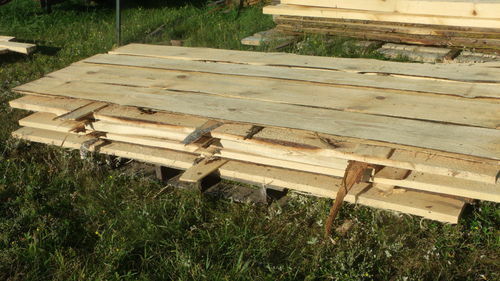 It’s rough sawn lumber, and that’s half the fun of what we do with a mill! -right? If you are thinking of a mill, this one is not the worst idea you could have. It might prove kinda fun, actually. Thanks for this review. Very good information. I didn’t even know HF made a mill. Would be a fun toy for me someday. I’m glad you’re enjoying yours. Thanks a lot for the info. I have indeed been thinking about and researching mills. I huge mill with hydrolics on it would be great, but as you pointed out, the price is hard to justify. I too just want to saw a few logs to build my projects. I am not interested in going into business. I will take another look at this mill after reading your review. Thanks for the review, I bought a different brand and am also having fun with it. Curious about where you get your blades as I don’t find them on the HF website. Also the sharpener you refer to, any more info on it? Thanks for the review, I bought a different brand and am also having fun with it. Curious about where you get your blades as I don t find them on the HF website. Also the sharpener you refer to, any more info on it? I don’t know about the sharpener but you can find the blades at this site. Richard has the link for the blades. Sorry I didn’t quite explain where I got them from . But ya, Cookssaw.com was the site. As for the sharpener, I use my 4” angle grinder with a standard grinder wheel. It’s best if the wheel is slightly used and has a rounded outer edge instead of a square/flat edge. The blades are probably the easiest thing to sharpen. YouTube has a boodle of videos that cover different scenarios as far as sharpening -but they all follow the same basic idea—trace, or just barely graze the shape of the teeth LIGHTLY with a grinder or dremel. Cooks does offer a saw set and a blade sharpener, but I’m not quite ready to shell out that much $ for either of those options. There are other sites and places that offer sharpeners too. However, I can maintenance a blade in under 20 minutes with the tools above and be back to cutting lumber in about the time it would take to just set those fancy tools up. It’s one of those dream tools that’s hard to justify for my situation. Every time I’m cutting up a deadfall, maple or black cherry for firewood i stop and think its not that crazy. My husband wants to buy this mill, I was happy to see the link to where to purchase blades, as I had no luck. If you have had to repair the machine, where did you go to buy parts? Thank you! Just a few shots of the stuff I milled out last summer… boards range from just under 9’ to just over 5’. My finally tally on total board feet cut last year was just over 4,100. Do you ever have trouble with ‘wavy’ cuts? I find that a new blade cuts well but only for a very short time. We cut a lot of Douglas Fir and I think it may be junk in the bark that is dulling the blades. Kind of a hassle to change the blades and it gets expensive to have them sharpened or replaced. Ya, junk in the blade can really mess things up. I try to peel the bark whenever possible. And I’ve got into a habit of sharpening the blade when I see any marks or changes in the cut patterns, especially with oak and sappy pines. I try to keep the blade tensioned & sharp as best I can. It’s a small mill so that doesn’t take much. I imagine a larger rig would involve more work in that regard. I know with old pine logs, if I’m moving too fast the blade gums up and makes a funky cut at each branch node. Sometimes I just have to move a little slower through certain species. 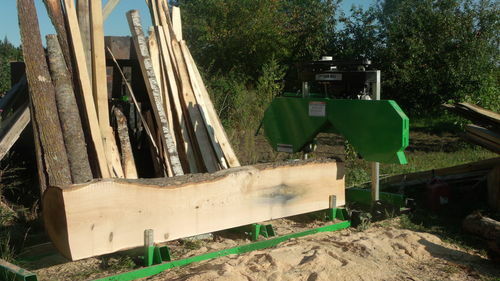 Green Pople, Aspen, and green Ash now… those are like butter and this thing slides right through those.